This Contemporary two-story home had several main floor entries. The front entry opened to a foyer with vaulted ceiling that then opened into the dining room, master bedroom, and living room. 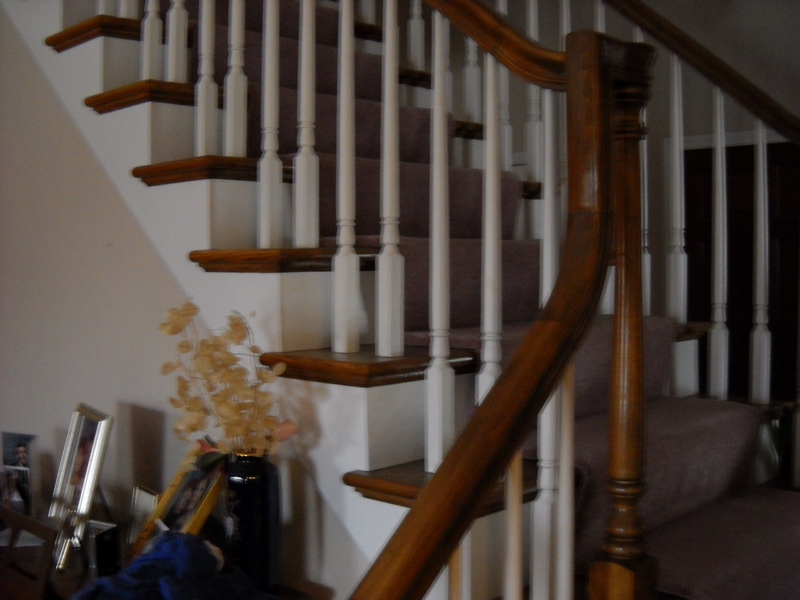 There is an elevated open stairway that overlooks all of these rooms. The challenge was to find the main focal point of each room, capture it, and showcase it well…but before we could move to the interior of the house, I felt we needed to work on CURB APPEAL. 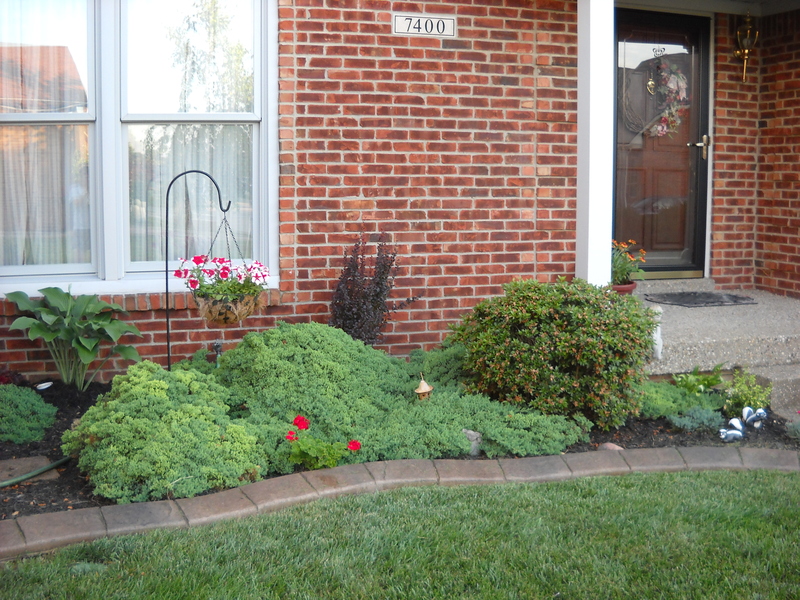 This was done by planting some beautifully inexpensive lush plants and rearranging things on the front porch. 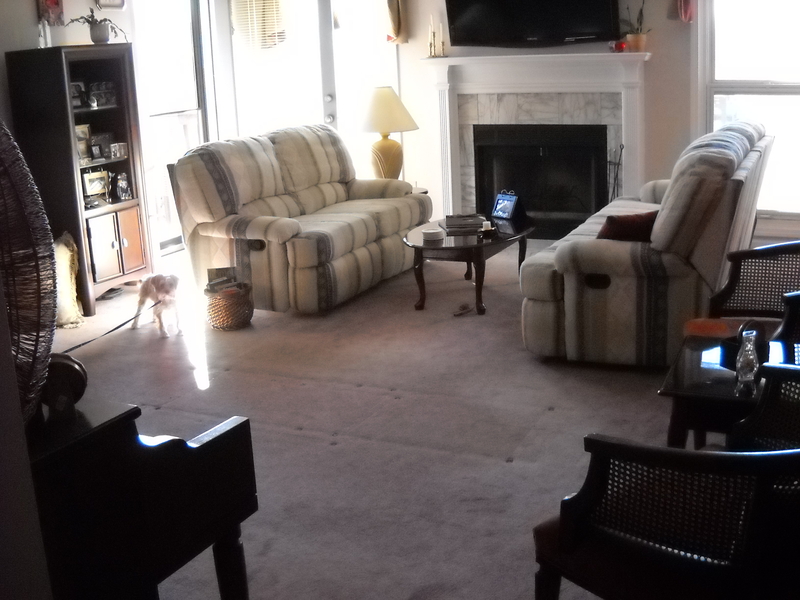 Main Entrance: Foyer to Living Room – BEFORE: With the back of the love seat facing the entrance, the natural flow into the area was blocked. With four entrances into the room, along with floor to ceiling windows, the fireplace and flat screen TV had lost the impact as the focal point. Overall, the first view of this home’s interior gave a buyer too much to look at and yet, nothing really to concentrate on. 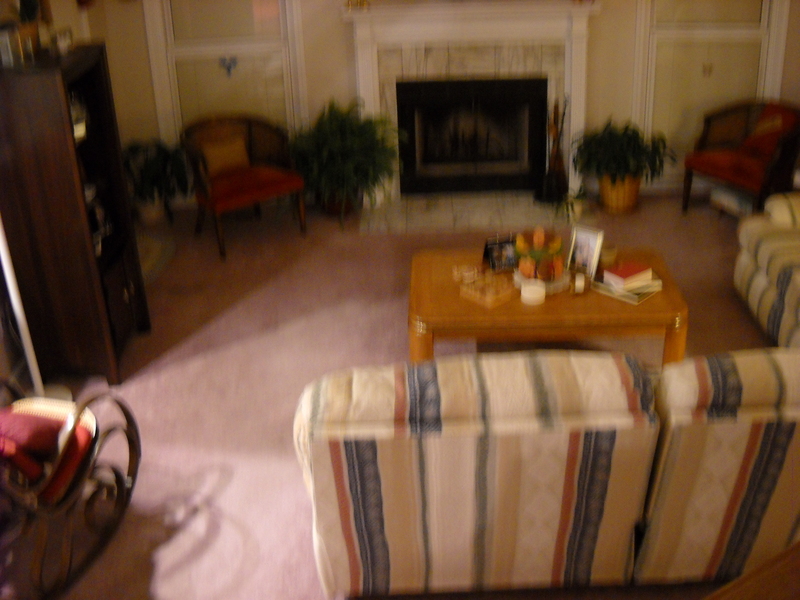 The first step to staging this room was to box up the clutter and rearrange the furniture. We removed floor mats from in front of door entrances. We put the sofa and love seat facing each other coming off the fireplace & mantle. We moved all plants upstairs. This helped to frame the fireplace and subtly draw the eye in. We left the piano on the opposing asymmetric wall of the back of the staircase. 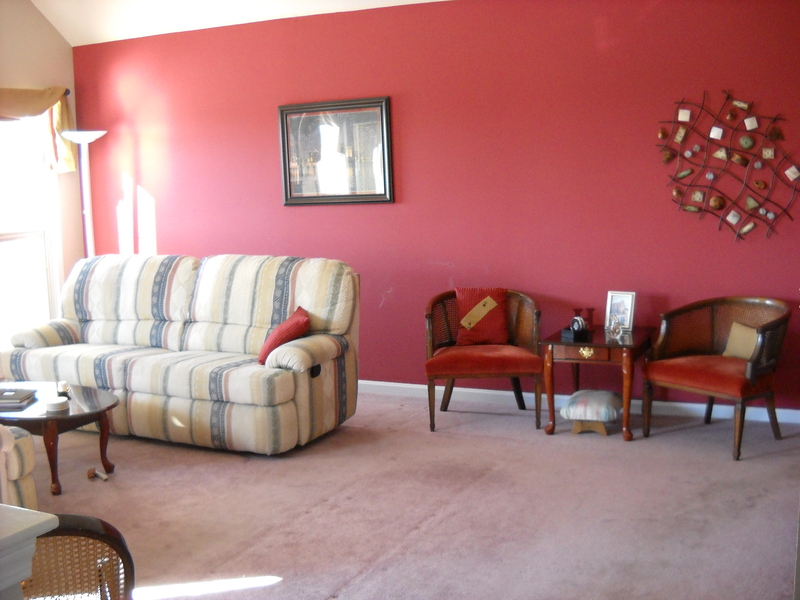 Because there seemed to be a red theme going….we recommended painting one wall “Roasted Red Pepper” by Porter Paint to give the room some “pop” and tie the reds together in all four (4) rooms. 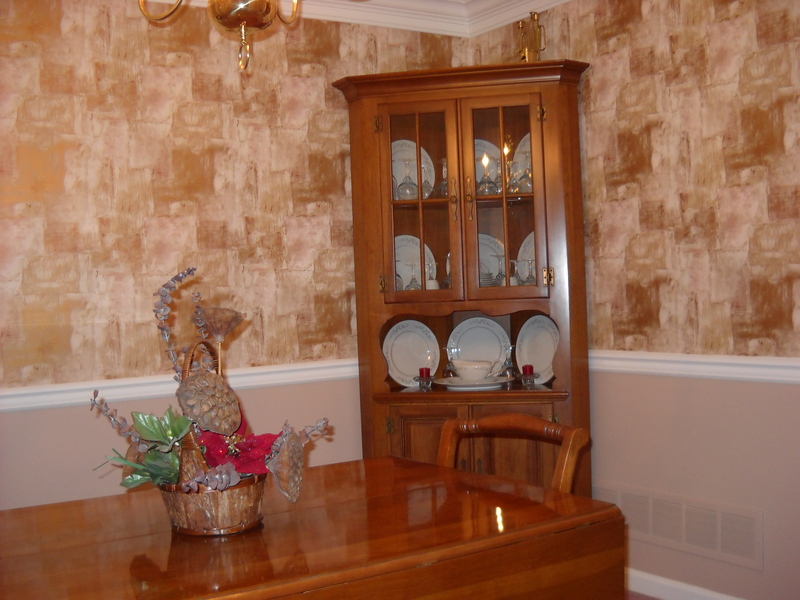 Family photos were cleared from the half wall going into the kitchen, and limited to displaying them in the curio cabinet and on top of piano. 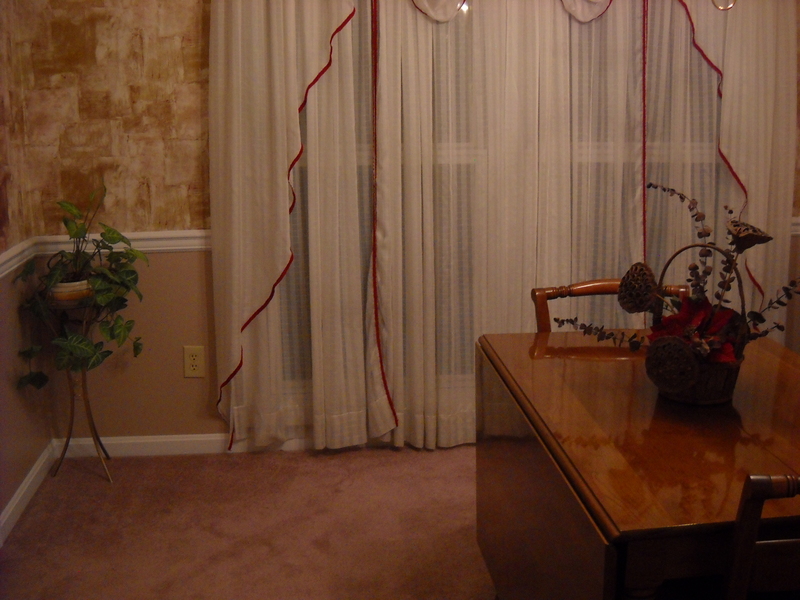 One tall vase from the piano was moved to the half wall in the kitchen to add dimension to the new bared space. On the mantle on either side of the TV, we left three brass candlesticks with fluted candles and placed a tall orchid with new shoots on the other side, along with a red square gel candle that had been setting on the floor in a wicker basket. This balanced out the mantle. The curio cabinet had to stay on the small wall between the back door and half wall to the kitchen because it housed the TV equipment. 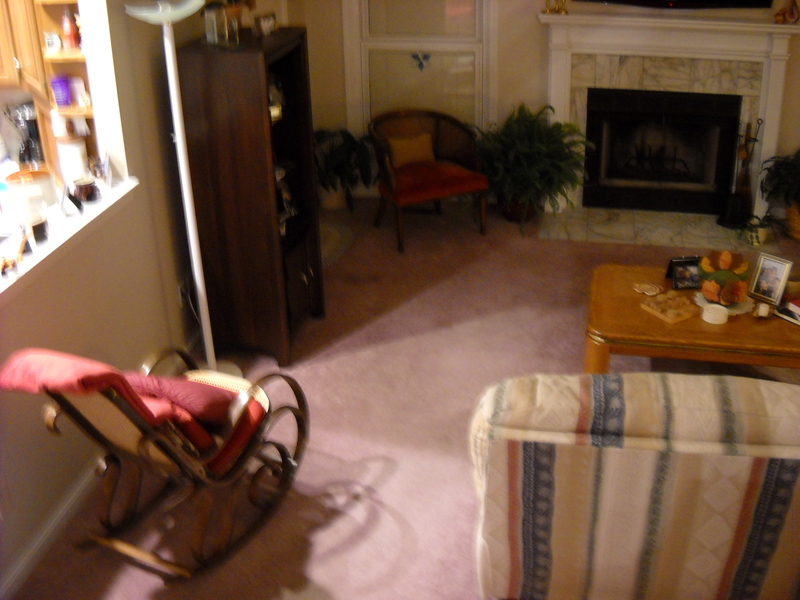 For this reason, the love seat was placed on that side of the room since it is shorter. Sun catchers were taken out of windows. We moved the two accessory chairs to make a separate little setting area on the long wall. This really opened up the room. We exchanged the large coffee and end tables with smaller ones that we found stored in the basement. Their wood color match to the piano, curio cabinet, and staircase was ideal! We suggested purchasing some inexpensive swag window valances to pull it all together. AFTER: A view of the living room now shows how the new arrangement compliments the area. By placing both the sofa and loveseat an entire 15 inches from the wall, the illusion of space is easily created, giving the room perspective and the focal point of the fireplace and mantle is enhanced. Removing the plants and many diminutive knickknacks previously shown throughout the room and instead using only distinct accessories makes all the difference in this room’s initial appearance. 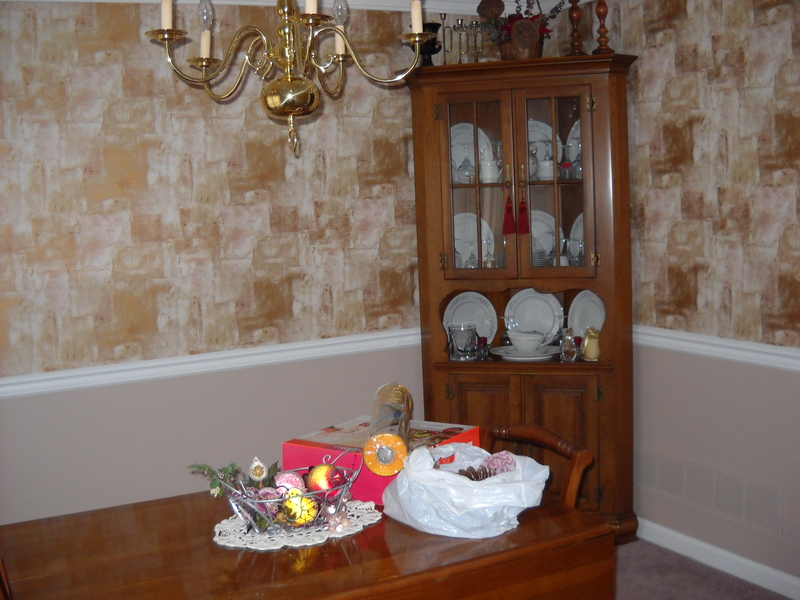 BEFORE: The Dining Room had a 3-piece cherry dining room set in a formal dining room with a tray ceiling. The china buffet, however, was being used to house lots of junk and was a “catchall” on the top of it as well. The room was also inundated with plants – some very healthy; some not. The double windows were the focal point in this room, but you couldn’t tell that with all the plants. Staging this room, we boxed up most everything on top and inside of the buffet, leaving only nice china to be shown. The dried floral arrangement on top of buffet was moved to the dining room table (without the Doily). There was a large red flower in this that blended well with the edging on the sheers & the wallpaper. 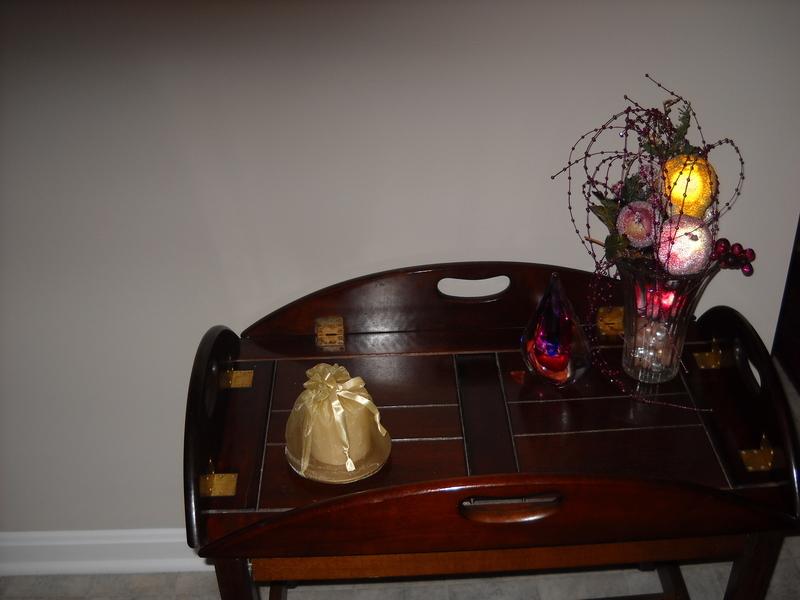 This one artificial plant showing on the nice wood of the table without the doily pulled it all together. We moved all but one plant to a second bedroom upstairs, and kept one very lush philodendron plant in the corner on a brass plant stand with a glass oval. 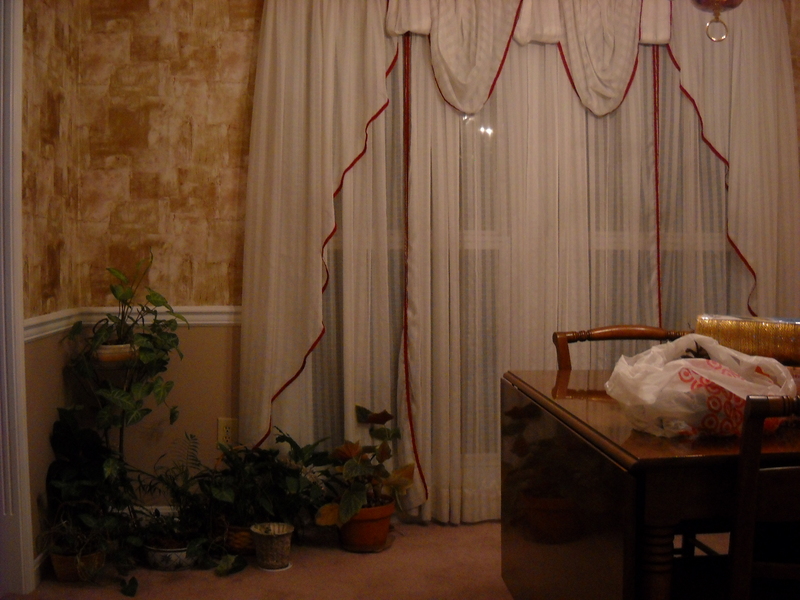 AFTER: This opened up the dining room nicely, and brought your eye to the windows. 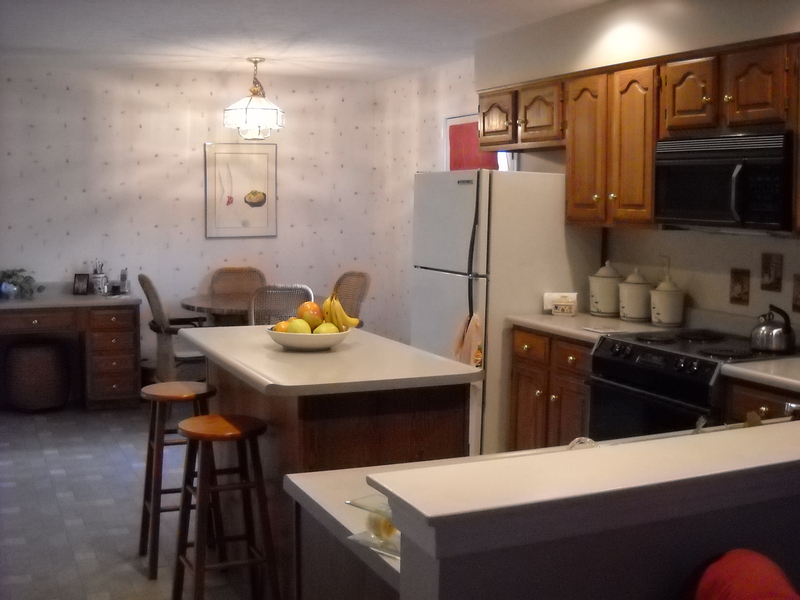 BEFORE: The Kitchen (viewed from the living room), was an open area with beautiful wood cabinets but these were detracted from with all the appliances, utensils, and kitchenware. Again, the first step toward staging this room was removing the clutter – there were pet toys, a pet crate, two throw rugs, coats and other paraphernalia hanging on a coat rack, and a lot of clutter on a beautiful wood pegged kitchen table. There was a small TV and converter on top of the refrigerator along with a plant. All of this did not show an open and airy room. We first cleared off counters and desk leaving only a few items so more Formica could be seen. 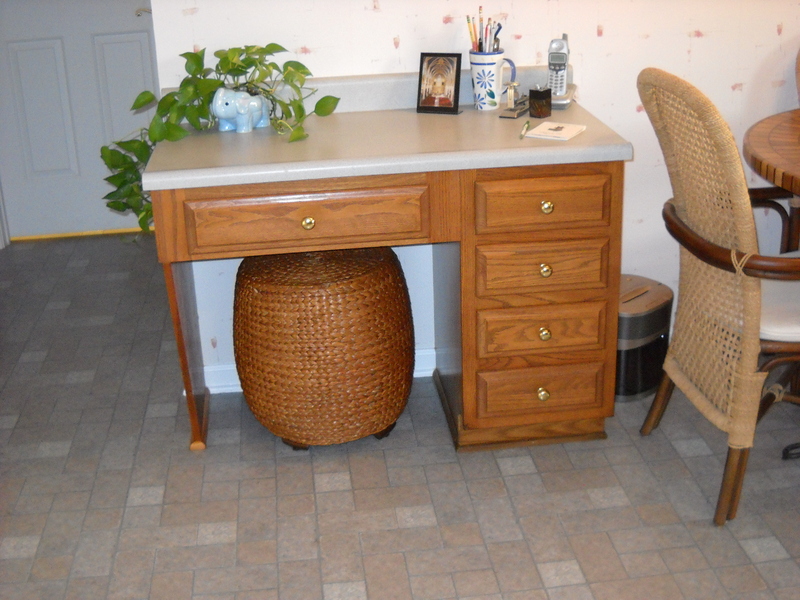 We found two tall matching oak stools to put at the island and a wicker stool for under the desk While keeping in mind, the buyer is not there to look at furniture, these cabinets were definitely an asset and needed to be tied into accessories. 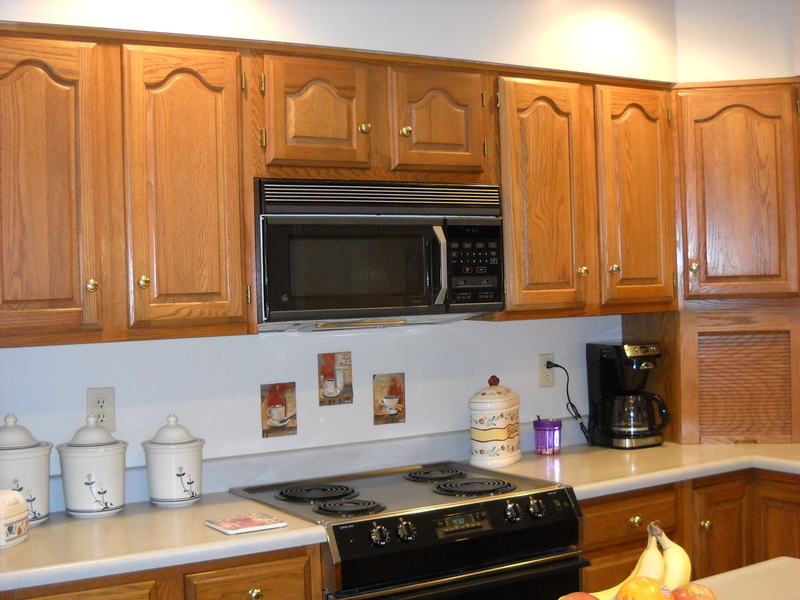 This pulled all the wood together nicely, showcasing the cabinetry and kitchen table. We moved the TV to a workroom in the basement. With Flat Screen in Living Room, this was no longer needed anyway. 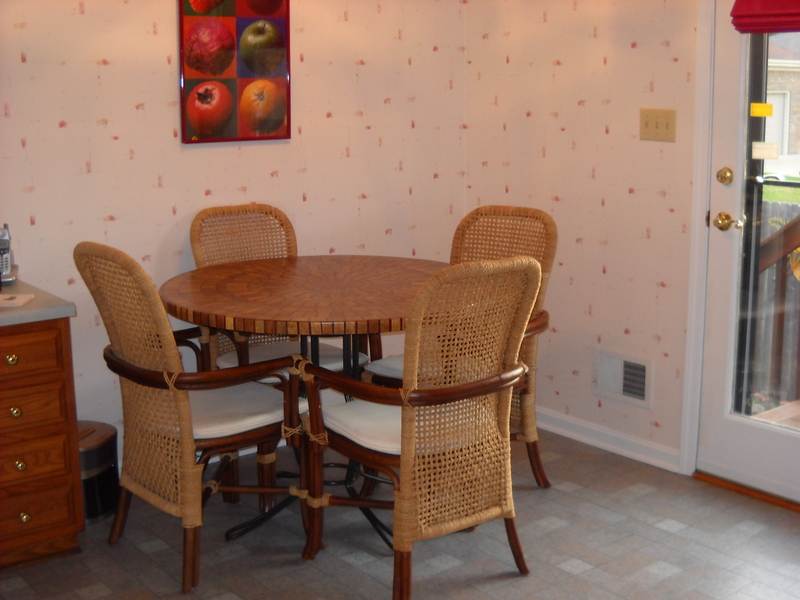 We exchanged pictures bringing one with lots of color to the wall above the dinette set. This brought out the wallpaper and opened up the area. There was a very unique coat rack affixed to the wall. It had vintage doorknobs with matching oak wood. I felt this needed to be viewed so we removed the coats and hung them in a closet. 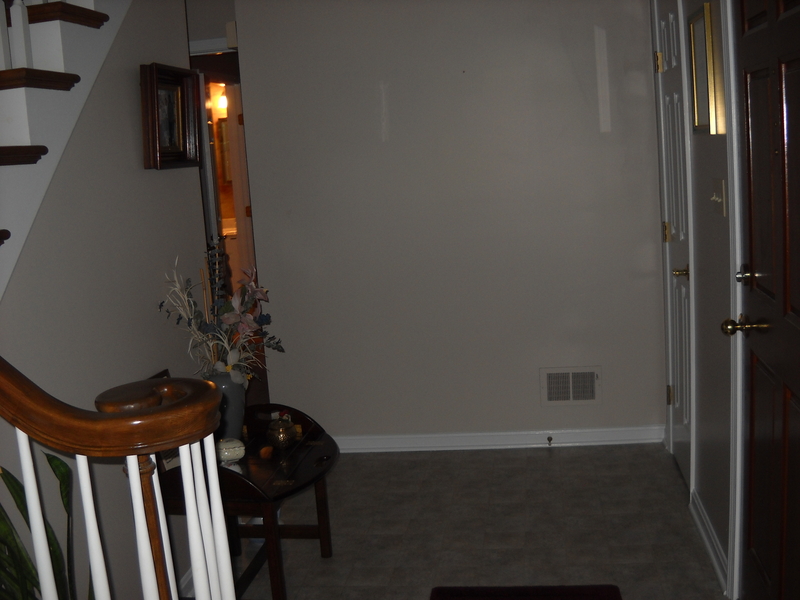 To keep the flooring open and consistent with the other rooms, rugs were removed. By packing away the excess, this gives the kitchen a more expansive feeling. By simplifying the chaos, the focus is placed on the actual space. 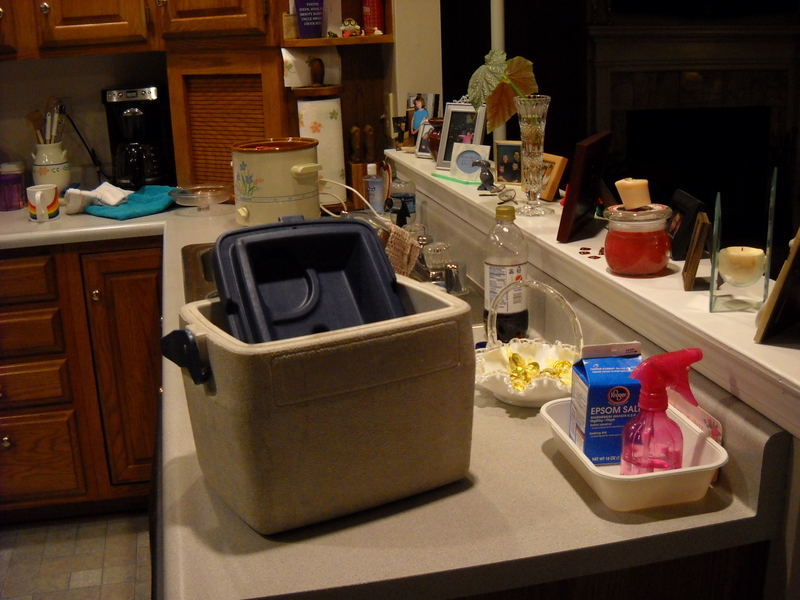 Only the absolute necessities were left on the counters. An attractive plant was added to the desk with only a few knickknacks. This room shows a really great living space for cooking, entertainment, and family life. Yes, they really are the same room! 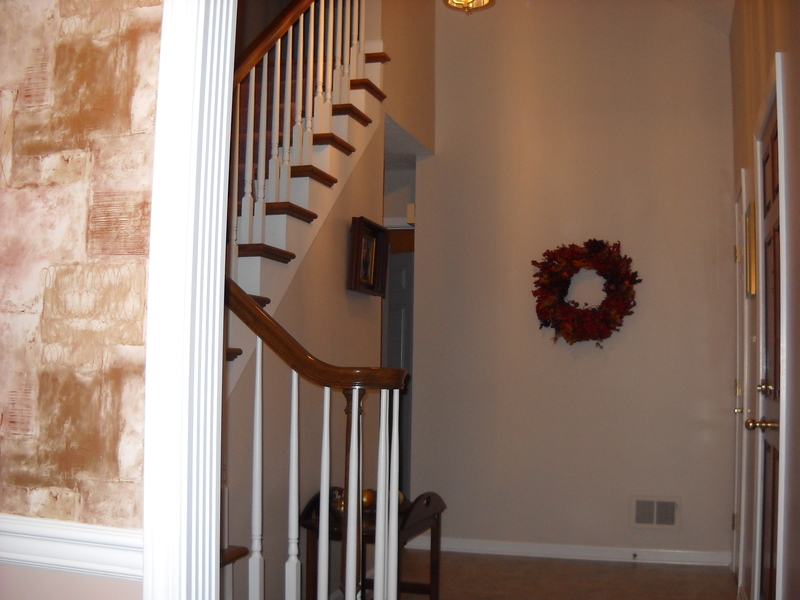 BEFORE: The Foyer entered, of course, from the front door could also be entered from either the living room, dining room or also from the great room across a beautiful open oak staircase. The foyer has a huge vaulted ceiling. There were burgundy throw rugs,bare walls (except for one family photo), a huge plant on a tiny ceramic elephant stand and a Butler’s table with way too many knickknacks. 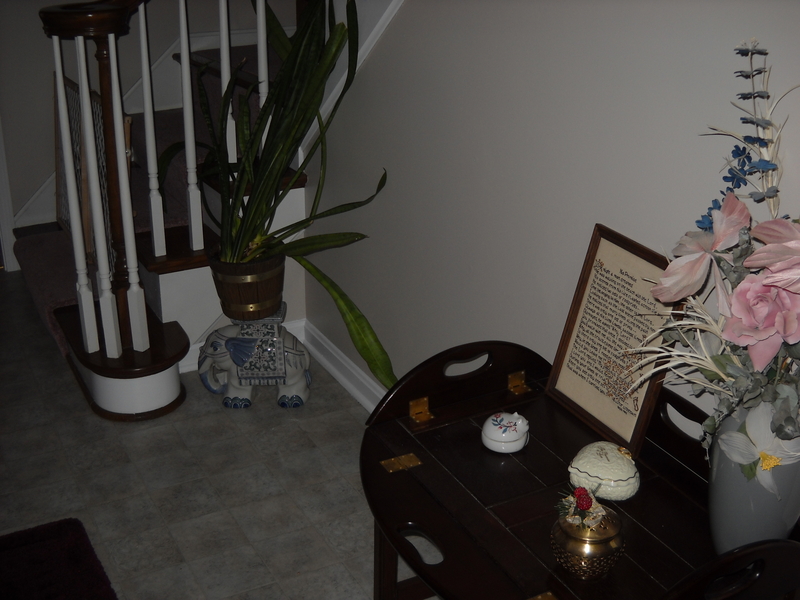 FOYER: To stage this room, we moved the plant and ceramic elephant upstairs. The items on the Butler’s table were put in storage. Anything ‘smaller than a football’ needs to go! We left the family photo (because it was in a beautiful wooden shadow box frame), and moved the Butler’s table just beneath it to pull the two woods together. This was on an asymmetric wall so we took a large lush fern from the family room to balance with the table on this wall. There was pearlescent fruit that had been “washed out” looking as the table centerpiece in the dining room. Instead, we put this in a large glass vase (found in the basement) with an object d’art from the family room of same color scheme. This was added to the top of the Butler’s table to be seen as you enter from the front door. Awesome! A large wreath was hung on the tall bare wall. We removed the throw rugs to show the beautiful faux marble flooring. 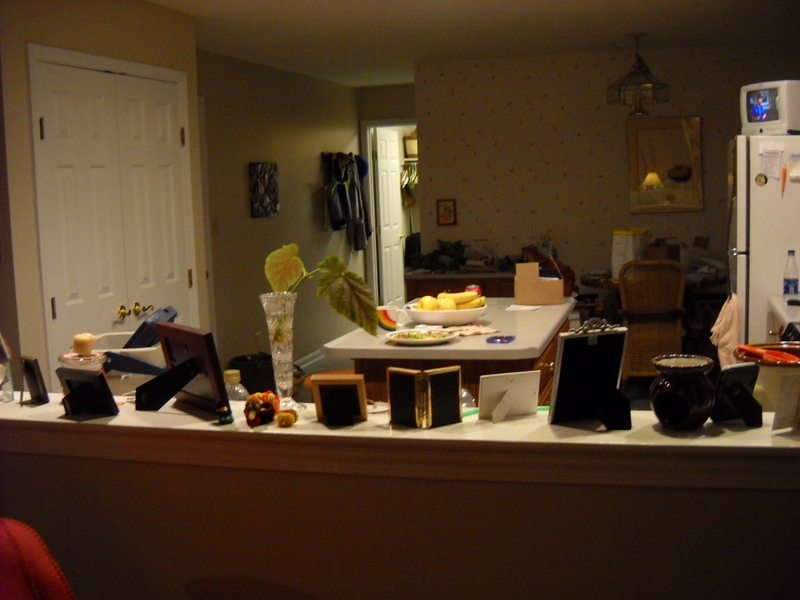 By doing all of this, it opened the foyer and left it uncluttered. 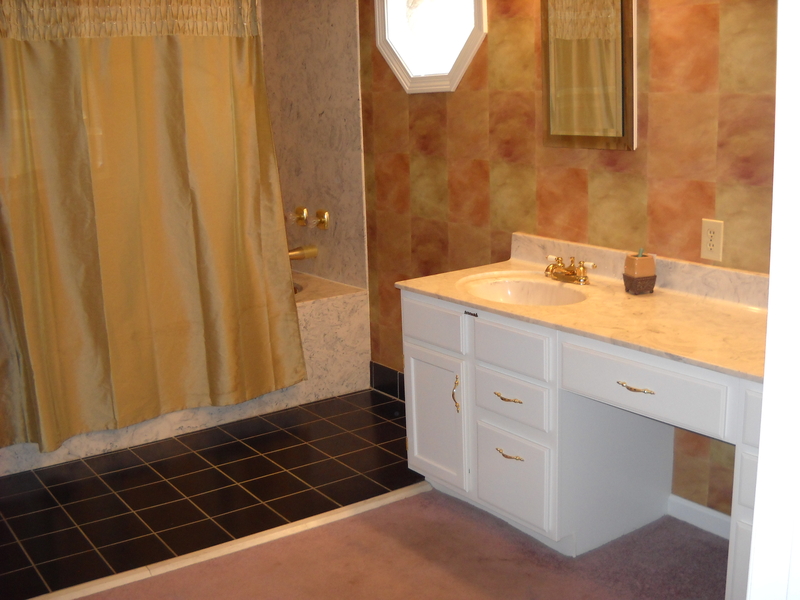 The 1st floor Master Bath was a large area with double vanity, 6 ft. shower/hot tub assembly, linen closet, huge walk-in closet and separate toilet area. Minimal improvements were needed to open up the space. There was a separate toilet area. This needed to be opened up as well and updated. Moving all lotions, cosmetics, and toiletries to the linen closet. 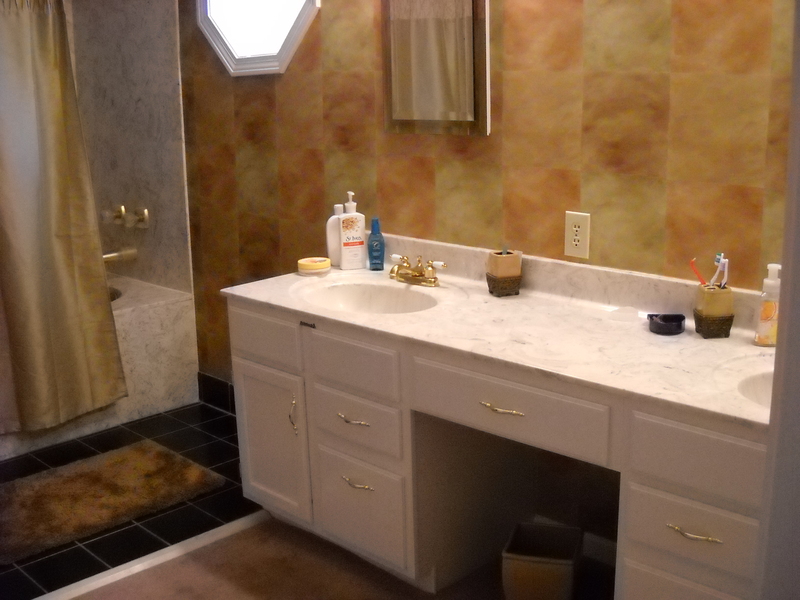 This opened up the vanity area and the beautiful variegated marble that the sinks were made of could really be visualized. 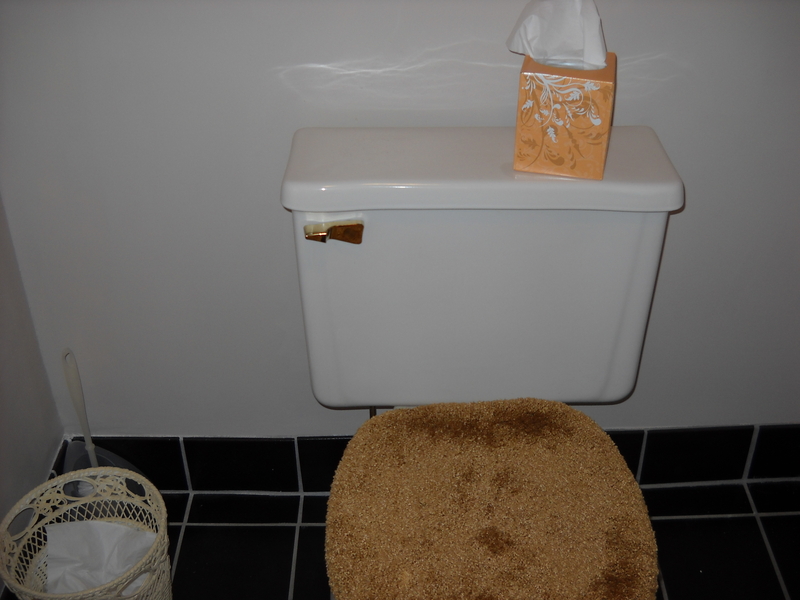 Removing the bath mats so the large black square marble tile could be seen. Cleaning up the toilet area and making it appear larger. 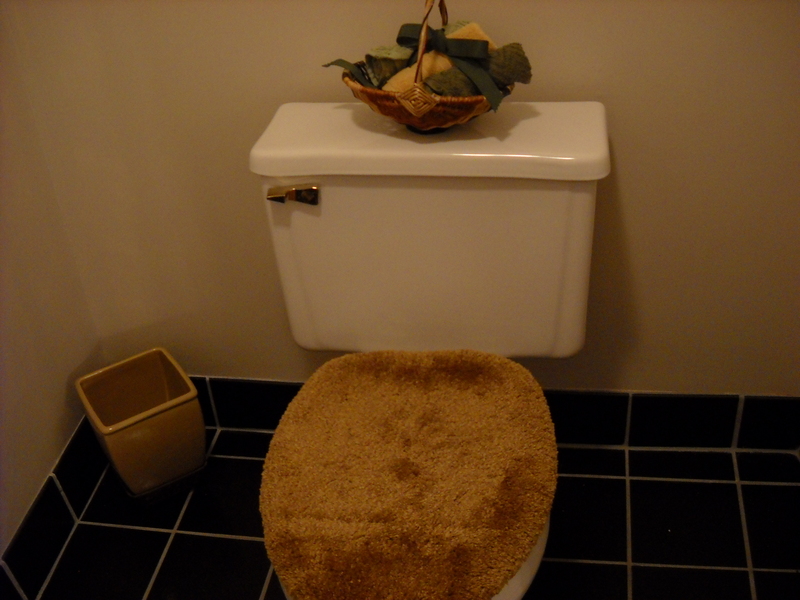 It had an old brown wooden magazine rack and an outdated basket of trinkets on the back of the toilet. We stored the magazines in the linen closet and moved the magazine rack to the den upstairs. We purchased some matching wash cloths at a discount store, took a piece of grosgrain ribbon that was in the sewing room, and pulled them together into a little tied-up package of rolled washcloths. Very cute and fashionable! From the door you could see the toilet bowl cleaner. 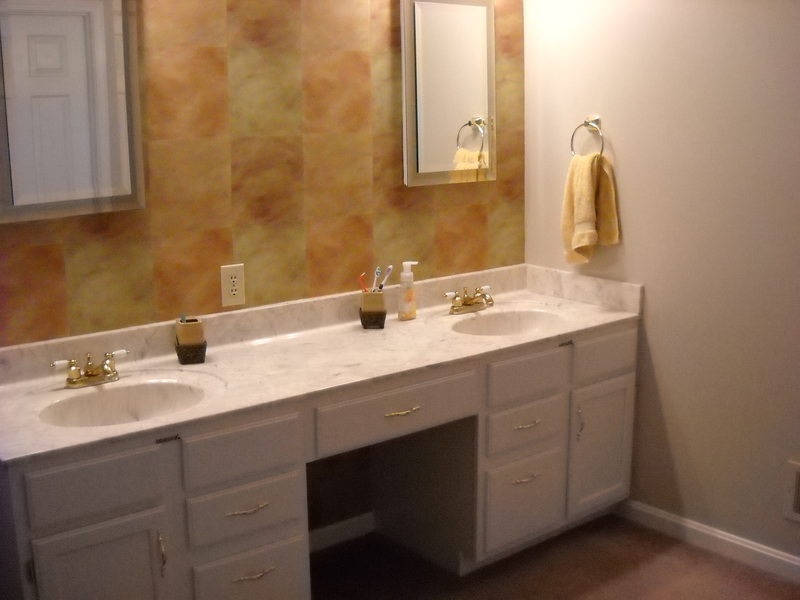 We removed this and put a nice cream colored wicker wastebasket in to blend with the color scheme. We also hung the third of a series that matched to those hung in the Master bedroom of Bistro pics. The frames were of the French Provincial era and really pulled the two rooms together. 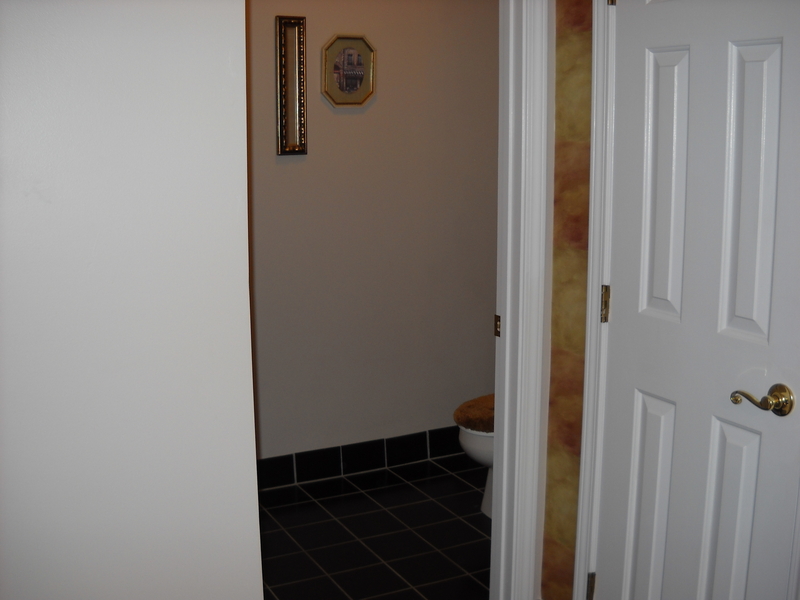 We also included a thin vertical mirror to make the toilet area appear larger. 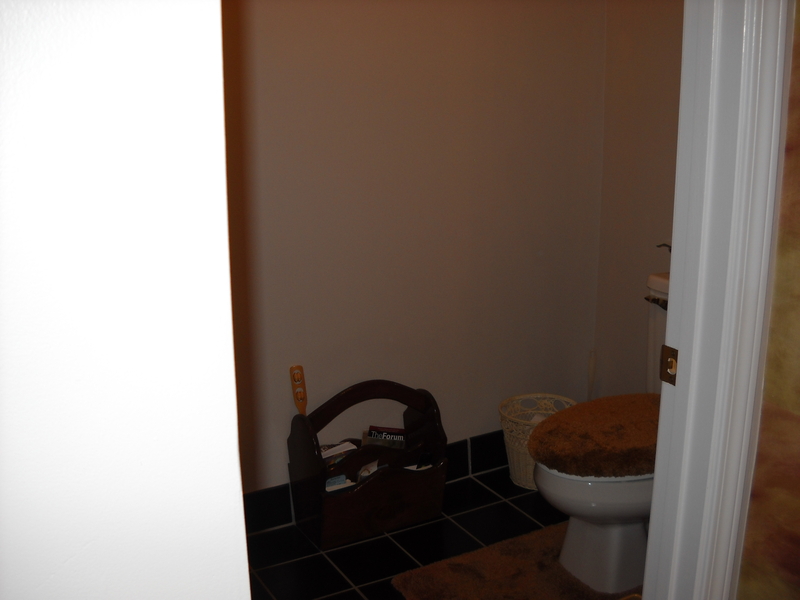 Now you can really see how large both the vanity area and toilet room are and the possibilities!! !